The 2017 Nissan Juke is one of the most customizable and stylish vehicles on the market today. With countless color combinations, you have a completely unique Juke that nobody else has. With over 10 customizable features and a multitude of colors to choose from, there is no better way to express yourself than with the 2017 Nissan Juke. The interior of the Juke also features sport bucket seats that fit close to your body and keep you in place while making any sharp turns. The 2017 Juke has a center console that got its inspiration from a sport motorcycle. A sleek and slender design really pops out with the available Performance Red or Gunmetal finish. In the back of the Juke, hidden beneath the cargo floor is a secret compartment straight out of the Millennium Falcon. Keep your personal belongings out of sight without compromising any of your cargo space in the 2017 Juke. 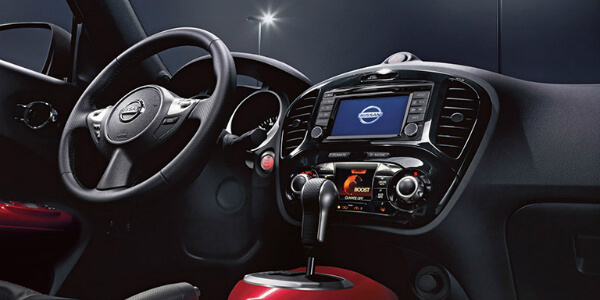 Let’s take a look at some of the other unbelievable features that the Juke has. To really put your parking into perspective, the 2017 Nissan Juke has an available Around View Monitor that gives you a bird’s eye view of the area around your vehicle. Partnered with Moving Object Detection, you’ll always know what is behind you, in front of you, and on either side of you while you’re parking. If you do ever get too close, your Juke will alert you with audible warnings. Nissan knows that every little bit can help and with the Electric Power Steering feature on the 2017 Juke. 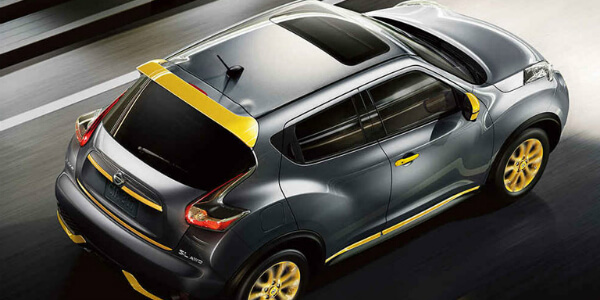 you’ll be able to cut down on power usage from the engine of your Juke to improve your already-amazing fuel economy. The Electric Power Steering can also adjust the way your Juke’s steering feels based on how fast or slow you are driving. The 2017 Nissan Juke also boasts a standard Direct Injection Gasoline turbo engine. This 1.6L beast puts heightened and turbocharged performance at your fingertips. This technology allows the 2017 Nissan Juke to have the power of a larger engine, while keeping the fuel economy of a smaller engine. When you’re feeling the need for a kick, get turbo performance from your engine until you’re ready to ease off and get the better fuel economy while you’re cruising. If you’re interested in test driving a 2017 Nissan Juke, or if you would like to learn more about its amazing features and color options, we encourage you to get in contact with us. One of our friendly and trained staff members will be able to give you all the information you need, and will get you behind the wheel of a 2017 Nissan Juke faster than ever.